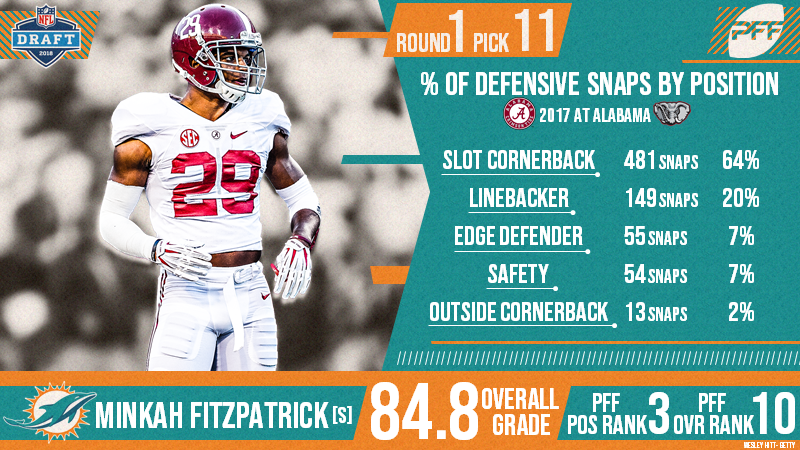 With the 11th selection of the 2018 NFL Draft, the Miami Dolphins have selected Minkah Fitzpatrick. The former Alabama star was selected 11th overall after finishing the 2017 season with an 84.8 overall grade. Fitzpatrick played just 13 snaps as a perimeter cornerback in 2017 and had the third-highest run-defense grade among cornerbacks in the class (85.2). Made 38 solo tackles in 2017, 23 of which were defensive stops, as he operated largely from the slot and around the line of scrimmage.